First off, many thanks to my friend Todd who offered to give me a deadline and read what I had! I wanted to take him up on it and that was enough to break my inertia, but now that I have spent some time looking at what I have, I’m not sure the term editing really covers the magnitude of the work that my NaNo draft needs. Editing implies to me, that a draft is more than 75% done. It needs the rough edges sanded, possibly some few scenes reordered, and maybe a few additional scenes added, but the foundations of the structure are sound. This doesn’t describe what I have. Revising doesn’t sound strong enough to me either. What I need to do is take the whole thing and rebuild it. I need a writing term more akin to gutting a house as opposed to remodeling a kitchen. It seems daunting but it’s also become an opportunity. I’ve been interested in learning Scrivener for a while now and this seemed like the perfect use for it. So I imported my NaNo draft and split it into it’s original chapters and then skimmed each chapter and split it into rough scenes. 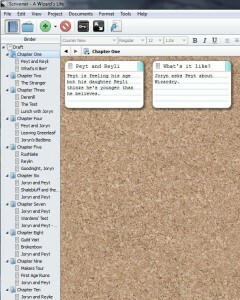 So far, Scrivener looks like an excellent tool for organizing and rearranging text. I’m working now on adding one to two sentence summaries of each scene as well as tagging what parts are really story and what parts are the original framing narrative that I used. This has been helpful in giving me a clearer picture of what I have and what the problems are. Of course fixing them is a whole different story, but at least now I’m able to work more easily on smaller pieces.